medical workers insert a tube through her nose. from the accident in Shelby. and tried hard to prevent its happening. under the weight of the burden of truth. hiding her face in a cotton blanket. welcome like the promises found in the canon of God. Yes. But hers is a much longer story. what the body fails to do. And sometimes it does know. and her mouth in sorrow now just forgets to eat. address her waning effort, her long-held depression. like Jesus, no, to Jesus: Take up thy bed, and walk! Is it all right to pray for snow? And they all said, yes! With the new year, the snow came. that helped us with the claiming of our peace. clogging her lungs with invisible pus. in the sore on her left leg was slow to heal. Fact is, it never did. we all wanted different things. And we did. We’re different people. frolic, but on a lonely slab of cracked cement. the daisies flutter at her with their ostrich-eyes. the coneflowers accent the white garden gate. patches of navy blue shade. or on the gourd that sits near the angel’s cooling toes. up to her knees in the drifts of a late winter snow. their yellows as soft as a neonate. a smudge of petal-pink for blush. She’s been crying but pretending she wasn’t. Richard Groves is the pastor of Wake Forest Baptist Church in Winston-Salem, NC. He once said reminded me that the truth does not lie somewhere between two extremes. The truth is wherever you find it. Dr. Groves continues to inspire me. There is much emphasis on notoriety and fame in our society. Our newspapers and television keep giving us the message: What counts is to be known, praised, and admired, whether you are a writer, an actor, a musician, or a politician. Still, real greatness is often hidden, humble, simple, and unobtrusive. It is not easy to trust ourselves and our actions without public affirmation. We must have strong self-confidence combined with deep humility. Some of the greatest works of art and the most important works of peace were created by people who had no need for the limelight. They knew that what they were doing was their call, and they did it with great patience, perseverance, and love. depending on how you interpret Al Gore. Mardi Gras precedes Lent, year after year. to tell us how dangerous I am. maybe I’ve been pushing the wrong buttons. 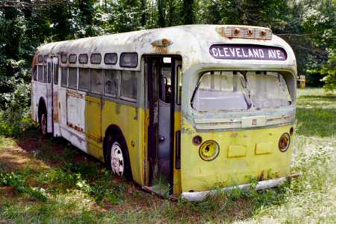 This photograph of the actual bus in which Rosa Parks refused to give up her seat was taken by Rev. Donnie Williams, a participant in the Montgomery Bus Boycott and author of The Thunder of Angels: The Montgomery Bus Boycott and the People Who Broke the Back of Jim Crow. The bus is now in Detroit at the Henry Ford Museum. an un-payable debt: A Pathway to Freedom. feel the Spirit and do the right thing. “If I perish, I perish,” she thought. she was a light to challenge the darkness. to honor her at this her Home-going. we’ll heed unto Preacher Jackson’s words. Intimacy between people requires closeness as well as distance. It is like dancing. Sometimes we are very close, touching each other or holding each other; sometimes we move away from each other and let the space between us become an area where we can freely move. To keep the right balance between closeness and distance requires hard work, especially since the needs of the partners may be quite different at a given moment. One might desire closeness while the other wants distance. One might want to be held while the other looks for independence. A perfect balance seldom occurs, but the honest and open search for that balance can give birth to a beautiful dance, worthy to behold.